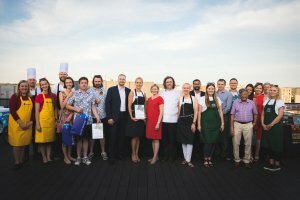 They‘ve honed their dish, beat off the annual competition and won the first prize of the British Chamber of Commerce in Lithuania (BCCL), that ended their season with the 5th Annual Curry Cook-off event on the Čiop Čiop rooftop terrace in Vilnius. All of the contestants prepared various curry dishes for an audience of BCCL members and friends on 28th June. 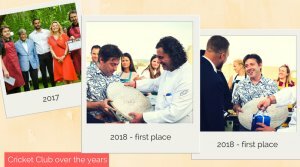 · So Stuart, Cricket Club of Lithuania team took part in all 5 BCCL Curry Cook-off cooking contests finally winning it this year. It would be interesting to hear where does your passion for curry actually come from? “ I’ve always liked exotic and spicy food and my first experience of South Asian/Indian inspired food was in the Balti Houses of my hometown. When I went to University I lived in a backstreet off “the curry mile” in Manchester where the very pleasant scent of Indian cooking would pass through the house pretty much all day and all night. · As representing Cricket club of Lithuania – could you tell us a bit what sort of interest cricket has built up in Lithuania? Is cricket actually equally important as Indian curry to you and your team made Darren? “ The cricket club was first established in 2008 when we rented a basketball hall to play indoors through the winter. Throughout the years the team has played in competitions in Latvia, Estonia and Hungary against many countries of Europe where the game is also played solely by amateurs mostly for fun. Lithuania has also hosted games against Estonia, Latvia, Poland and many touring cricket clubs from the UK and Belgium. Cricket in Lithuania faces a challenge to survive because there are very few grass sports fields and there is only one field at Vingis Park which is big enough to contain a full size field. The majority of players are from the major cricket playing nations and it’s not easy to attract beginner level players because the game is so technical to teach. · Where did you learn to make curries? Have you ever attended a culinary course? “ I’ve made curries for many years but looking back it wasn’t until the BCCL Curry Cook-off that I’ve produced anything good enough to be served in a reputable Indian restaurant. It’s because of the competition that I’ve been motivated to learn and experiment. When I look back to first competition it’s incredible to observe how the standard of food the teams produce improves greatly year upon year. · What made you to win this year? Any ideas on why the judges have chosen your team for the main award? “ I have to give much credit to my curry partner Darren who came up with a few tweaks in the recipe as well as developing the freestyle curry. He also did a lot of sourcing and experimentation of the individual ingredients. 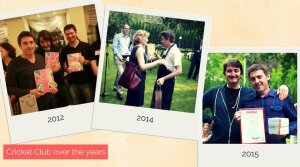 · Why this British Chamber social summer event is essential to you? Does it have any cultural importance for you both as British living in Lithuania? “ The event is a celebration of British food and despite the origin being in a far away land, curry is now fully integrated into British culture much the same as sashlik is in Lithuania. · Do you actually love cooking at home and what is your signature dish then? “ I like cooking at home and all the curries I make are usually unique and to my particular desired spice and flavour. Cooking to a specific requirement such as a Chicken Tikka Masala for the competition takes a lot longer as consistency is harder to achieve in a domestic setting. · And finally, not a question but maybe asking for a favour – would you share your secret recipe with us and your fans? It was a great event, thank you all very much.